Another one of my hobbies is sailing. I originally learnt to sail when I was at secondary school. I was fortunate enough that it was one of the sports I could opt to do. I learnt to sail in an yellow fibreglass hulled Enterprise called Avocet - sail number E16664 from memory! I was also in a Scout Troop (RGS 'B' Troop) which specialised in water activities. 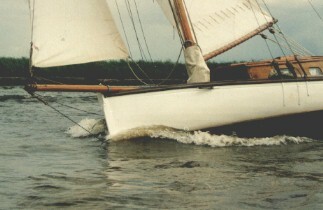 It was with that Scout Troop that I had the opportunity to sail on the Norfolk Broads. I only had to sail there once to became hooked. Up until recently I had sailed for at least a week there every year since about 1989. I hope that next year (2002) I will make it back some time. When I say sailing I do mean with sails - none of this bumbling around in slow, smelly diesel powered stink boats. I absolutely love sailing the Norfolk White Boats - the half decked 23 ft Yare and Bure 1 Designs or "Sundew" which is a Waveney 1 Design available for hire from Hunters Boat Yard in Ludham. The pace of life and the whole environment are so different from where I live and work that I find it really easy to relax, reflect and forget the problems. If the wind is right, you can really have a thrill sailing the boats. There is a marvelous adrenalin rush from tacking perfectly and overtaking the slower boats. Over the years I must have taken hundreds of photos on the broads. Unfortunately, at present very few of them come to hand for scanning in. These will have to do!